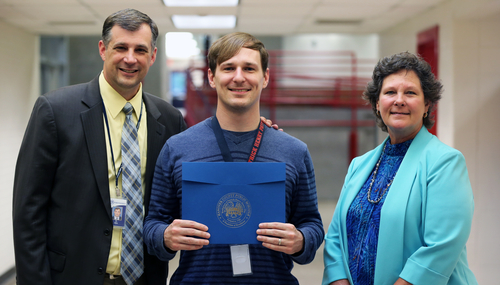 Jeremy Smith, an English teacher at Patrick Henry High School (PHHS), has been selected as the 2018 Beginning Teacher of the Year. Smith has been employed with Hanover County Public Schools since August of 2017. He received his Bachelor’s and Master’s degrees from Virginia Commonwealth University. Smith is also a Hanover County Public Schools graduate. “Jeremy Smith impressed me, my administrative team, his cooperating teacher, his students, and their families when he served as a student teacher last spring. We were fortunate to be able to hire him full-time this year, and he has exceeded our expectations! Always ready with a positive outlook, Mr. Smith embraces difficulties as opportunities for positive changes, and he approaches reluctant learners as challenges to his ability to connect class content to relevant issues in our teens’ lives. As a first-year teacher, Mr. Smith not only delivered stellar instruction in the classroom, he also developed positive, respectful relationships with students. He further enhanced this through his role as a Wrestling Coach. Jeremy Smith truly represents the caliber of a role model and instructor for which HCPS is known,” said Beth Smith, Principal. Each year, the division selects one new teacher for this distinguished award who exhibits several qualities, such as: being inspirational, poised, articulate, and knowledgeable; exceptionally skilled and dedicated; respected and admired by students, parents, and colleagues; and actively and meaningfully involved in their school and community.